Paul Revere, “Landing of the Troops,” ca. 1770, via The American Antiquarian Society. ¶ 2 Leave a comment on paragraph 2 0 In the 1760s, Benjamin Rush, a native of Philadelphia, recounted a visit to Parliament. Upon seeing the King’s throne in the House of Lords, Rush said he “felt as if he walked on sacred ground” with “emotions that I cannot describe.” ((Benjamin Rush to Ebenezer Hazard, October 22, 1768, in L. H. Butterfield, ed., Letters of Benjamin Rush, 2 vols. (Princeton: Princeton University Press, 1951), 1:68.)) Throughout the eighteenth century, colonists had developed significant emotional ties with both the British monarchy and the British constitution. British subjects enjoyed a degree of liberty unknown in the unlimited monarchies of France and Spain. The British North American colonists had just helped to win a world war and most, like Rush, had never been more proud to be British. And yet, in a little over a decade, those same colonists would declare their independence and break away from the British Empire. Seen from 1763, nothing would have seemed as improbable as the American Revolution. ¶ 3 Leave a comment on paragraph 3 0 The Revolution built institutions and codified the language and ideas that still define Americans’ image of themselves. Moreover, revolutionaries justified their new nation with radical new ideals that changed the course of history and sparked a global “age of revolution.” But the Revolution was as paradoxical as it was unpredictable. A revolution fought in the name of liberty allowed slavery to persist. Resistance to centralized authority tied disparate colonies ever closer together under new governments. The revolution created politicians eager to foster republican selflessness and protect the public good but also encouraged individual self-interest and personal gain. The “founding fathers” instigated and fought a revolution to secure independence from Britain, but they did not fight that revolution to create a “democracy.” To successfully rebel against Britain, however, required more than a few dozen “founding fathers.” Common colonists joined the fight, unleashing popular forces that shaped the Revolution itself, often in ways not welcomed by elite leaders. But once unleashed, these popular forces continued to shape the new nation and indeed the rest of American history. ¶ 5 Leave a comment on paragraph 5 0 The American Revolution had both long-term origins and short-term causes. In this section, we will look broadly at some of the long-term political, intellectual, cultural, and economic developments in the eighteenth century that set the context for the crisis of the 1760s and 1770s. ¶ 10 Leave a comment on paragraph 10 1 In the 1740s, two seemingly conflicting bodies of thought—the Enlightenment and the Great Awakening—began to combine in the colonies and challenge older ideas about authority. Perhaps no single philosopher had a greater impact on colonial thinking than John Locke. In his Essay Concerning Human Understanding, Locke argued that the mind was originally a tabula rasa (or blank slate) and that individuals were formed primarily by their environment. The aristocracy then were wealthy or successful because they had greater access to wealth, education, and patronage and not because they were innately superior. Locke followed this essay with Some Thoughts Concerning Education, which introduced radical new ideas about the importance of education. Education would produce rational human beings capable of thinking for themselves and questioning authority rather than tacitly accepting tradition. These ideas slowly came to have far-reaching effects in the colonies and, later, the new nation. ¶ 11 Leave a comment on paragraph 11 1 At the same time as Locke’s ideas about knowledge and education spread in North America, the colonies also experienced an unprecedented wave of evangelical Protestant revivalism. In 1739-40, the Rev. George Whitefield, an enigmatic, itinerant preacher, traveled the colonies preaching Calvinist sermons to huge crowds. Unlike the rationalism of Locke, his sermons were designed to appeal to his listeners’ emotions. Whitefield told his listeners that salvation could only be found by taking personal responsibility for one’s own unmediated relationship with God, a process which came to be known as a “conversion” experience. He also argued that the current Church hierarchies populated by “unconverted” ministers only stood as a barrier between the individual and God. In his wake, new traveling preachers picked up his message and many congregations split. Both Locke and Whitefield had empowered individuals to question authority and to take their lives into their own hands. ¶ 12 Leave a comment on paragraph 12 0 In other ways, eighteenth-century colonists were becoming more culturally similar to Britons, a process often referred to as “Anglicization.” As the colonial economies grew, they quickly became an important market destination for British manufacturing exports. Colonists with disposable income and access to British markets attempted to mimic British culture. By the middle of the eighteenth century, middling-class colonists could also afford items previously thought of as luxuries like British fashions, dining wares, and more. The desire to purchase British goods meshed with the desire to enjoy British liberties. ((Jack P. Greene, Pursuits of Happiness: The Social Development of Early Modern British Colonies and the Formation of American Culture (Chapel Hill: University of North Carolina Press., 1988), 170-1. Also, see John Murrin, “Anglicizing an American Colony: The Transformation of Provincial Massachusetts,” PhD diss., Yale University, 1966.)) These political, intellectual, cultural, and economic developments built tensions that rose to the surface when, after the Seven Years’ War, Britain finally began to implement a program of imperial reform that conflicted with colonists’ understanding of the empire and their place in it. ¶ 14 Leave a comment on paragraph 14 1 Most immediately, the American Revolution resulted directly from attempts to reform the British Empire after the Seven Years’ War. The Seven Years’ War culminated nearly a half-century of war between Europe’s imperial powers. It was truly a world war, fought between multiple empires on multiple continents. At its conclusion, the British Empire had never been larger. Britain now controlled the North American continent east of the Mississippi River, including French Canada. It had also consolidated its control over India. But, for the ministry, the jubilation was short-lived. The realities and responsibilities of the post-war empire were daunting. War (let alone victory) on such a scale was costly. Britain doubled the national debt to 13.5 times its annual revenue. In addition to the costs incurred in securing victory, Britain was also looking at significant new costs required to secure and defend its far-flung empire, especially the western frontiers of the North American colonies. These factors led Britain in the 1760s to attempt to consolidate control over its North American colonies, which, in turn, led to resistance. ¶ 15 Leave a comment on paragraph 15 1 King George III took the crown in 1760 and brought Tories into his Ministry after three decades of Whig rule. They represented an authoritarian vision of empire where colonies would be subordinate. The Royal Proclamation of 1763 was Britain’s first major postwar imperial action concerning North America. The King forbade settlement west of the Appalachian Mountains in an attempt to limit costly wars with Native Americans. Colonists, however, protested and demanded access to the territory for which they had fought alongside the British. ¶ 16 Leave a comment on paragraph 16 1 In 1764, Parliament passed two more reforms. The Sugar Act sought to combat widespread smuggling of molasses in New England by cutting the duty in half but increasing enforcement. Also, smugglers would be tried by vice-admiralty courts and not juries. Parliament also passed the Currency Act, which restricted colonies from producing paper money. Hard money, like gold and silver coins, was scarce in the colonies. The lack of currency impeded the colonies’ increasingly sophisticated transatlantic economies, but it was especially damaging in 1764 because a postwar recession had already begun. Between the restrictions of the Proclamation of 1763, the Currency Act, and the Sugar Act’s canceling of trials-by-jury for smugglers, some colonists began to fear a pattern of increased taxation and restricted liberties. ¶ 17 Leave a comment on paragraph 17 1 In March 1765, Parliament passed the Stamp Act. The act required many documents be printed on paper that had been stamped to show the duty had been paid, including newspapers, pamphlets, diplomas, legal documents, and even playing cards. The Sugar Act of 1764 was an attempt to get merchants to pay an already-existing duty, but the Stamp Act created a new, direct (or “internal”) tax. Parliament had never before directly taxed the colonists. Instead, colonies contributed to the empire through the payment of indirect, “external” taxes, such as customs duties. In 1765, Daniel Dulany of Maryland wrote, “A right to impose an internal tax on the colonies, without their consent for the single purpose of revenue, is denied, a right to regulate their trade without their consent is, admitted.” (([Daniel Dulany], Considerations on the Propriety of imposing Taxes in the British Colonies, for the Purpose of raising a Revenue, by Act of Parliament. The Second Edition (Annapolis: Printed and Sold by Jonas Green, 1765), 34. For a 1766 London reprint, see https://archive.org/details/cihm_20394.)) Also, unlike the Sugar Act, which primarily affected merchants, the Stamp Act directly affected numerous groups throughout colonial society, including printers, lawyers, college graduates, and even sailors who played cards. This led, in part, to broader, more popular resistance. ¶ 19 Leave a comment on paragraph 19 0 Men and women politicized the domestic sphere by buying and displaying items that conspicuously revealed their position for or against Parliamentary actions. This witty teapot, which celebrates the end of taxation on goods like tea itself, makes clear the owner’s perspective on the egregious taxation. 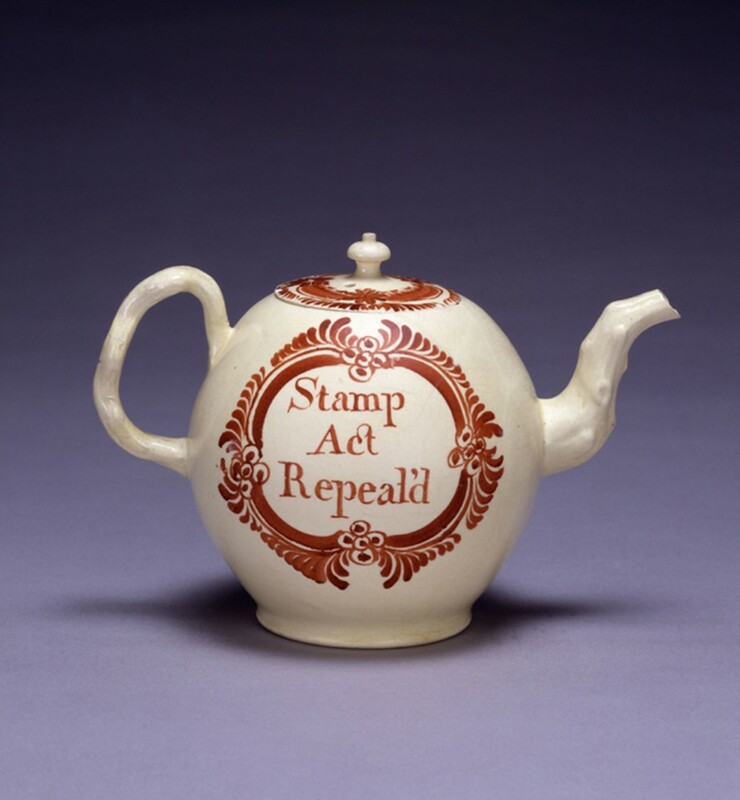 “Teapot, Stamp Act Repeal’d,” 1786, in Peabody Essex Museum. Salem State University. ¶ 28 Leave a comment on paragraph 28 0 his House, Person, & Effects. ¶ 31 Leave a comment on paragraph 31 0 By November 16, all of the original twelve stamp distributors had resigned, and by 1766, groups who called themselves the “Sons of Liberty” were formed in most of the colonies to direct and organize further popular resistance. These tactics had the dual effect of sending a message to Parliament and discouraging colonists from accepting appointments as stamp collectors. With no one to distribute the stamps, the Act became unenforceable. ¶ 32 Leave a comment on paragraph 32 0 Violent protest by groups like the Sons of Liberty created quite a stir both in the colonies and in England itself. 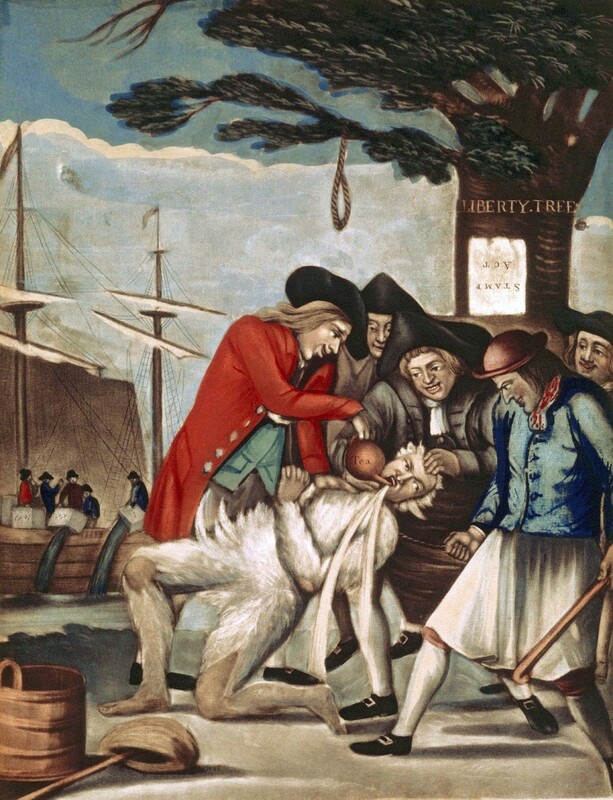 While extreme acts like the tarring and feathering of Boston’s Commissioner of Customs in 1774 propagated more protest against symbols of Parliament’s tyranny throughout the colonies, violent demonstrations were regarded as acts of terrorism by British officials. 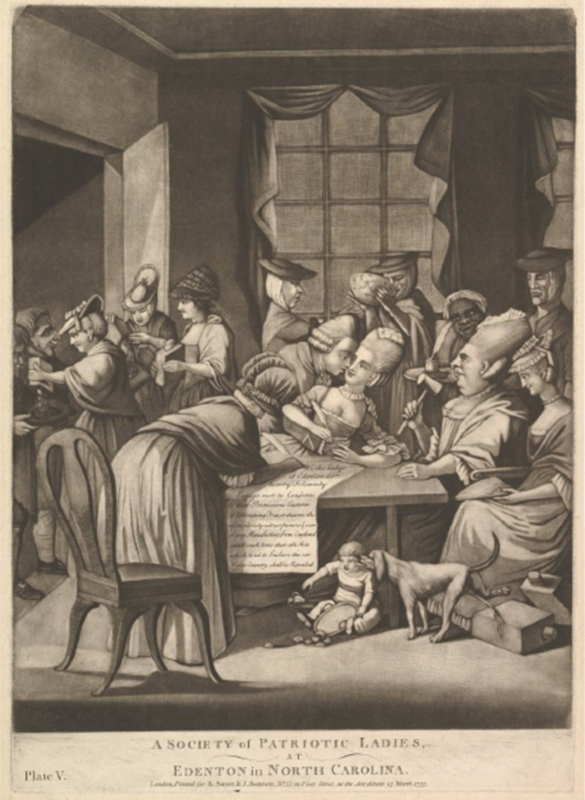 This print of the 1774 event was from the British perspective, picturing the Sons as brutal instigators with almost demonic smiles on their faces as they enacted this excruciating punishment on the Custom Commissioner. Philip Dawe (attributed), “The Bostonians Paying the Excise-man, or Tarring and Feathering,” Wikimedia. ¶ 34 Leave a comment on paragraph 34 1 The colonies had resisted the implementation of direct taxes, but the Declaratory Act reserved Parliament’s right to impose them. And, in the colonists’ dispatches to Parliament and in numerous pamphlets, they had explicitly acknowledged the right of Parliament to regulate colonial trade. So Britain’s next attempt to draw revenues from the colonies, the Townshend Acts, were passed in June 1767, creating new customs duties on common items, like lead, glass, paint, and tea, instead of direct taxes. The Acts also created and strengthened formal mechanisms to enforce compliance, including a new American Board of Customs Commissioners and more vice-admiralty courts to try smugglers. Revenues from customs seizures would be used to pay customs officers and other royal officials, including the governors, thereby incentivizing them to convict offenders. These acts increased the presence of the British government in the colonies and circumscribed the authority of the colonial assemblies, since paying the governor’s salary had long given the assemblies significant power over them. Unsurprisingly, colonists, once again, resisted. ¶ 36 Leave a comment on paragraph 36 1 New forms of resistance emerged in which elite, middling, and working class colonists participated together. Merchants re-instituted non-importation agreements, and common colonists agreed not to consume these same products. Lists were circulated with signatories promising not to buy any British goods. These lists were often published in newspapers, bestowing recognition on those who had signed and led to pressure on those who had not. ¶ 38 Leave a comment on paragraph 38 3 Homespun clothing quickly became a marker of one’s virtue and patriotism, and women were an important part of this cultural shift. At the same time, British goods and luxuries previously desired now became symbols of tyranny. Non-importation, and especially, non-consumption agreements changed colonists’ cultural relationship with the mother country. Committees of Inspection that monitored merchants and residents to make sure that no one broke the agreements. Offenders could expect to be shamed by having their names and offenses published in the newspaper and in broadsides. ¶ 39 Leave a comment on paragraph 39 1 Non-importation and non-consumption helped forge colonial unity. Colonies formed Committees of Correspondence to keep each other informed of the resistance efforts throughout the colonies. Newspapers reprinted exploits of resistance, giving colonists a sense that they were part of a broader political community. The best example of this new “continental conversation” came in the wake of the “Boston Massacre.” Britain sent regiments to Boston in 1768 to help enforce the new acts and quell the resistance. On the evening of March 5, 1770, a crowd gathered outside the Custom House and began hurling insults, snowballs, and perhaps more at the young sentry. When a small number of soldiers came to the sentry’s aid, the crowd grew increasingly hostile until the soldiers fired. After the smoke cleared, five Bostonians were dead, including one of the ringleaders, Crispus Attucks, a former slave turned free dockworker. The soldiers were tried in Boston and won acquittal, thanks, in part, to their defense attorney, John Adams. News of the “Boston Massacre” spread quickly through the new resistance communication networks, aided by a famous engraving initially circulated by Paul Revere, which depicted bloodthirsty British soldiers with grins on their faces firing into a peaceful crowd. The engraving was quickly circulated and reprinted throughout the colonies, generating sympathy for Boston and anger with Britain. 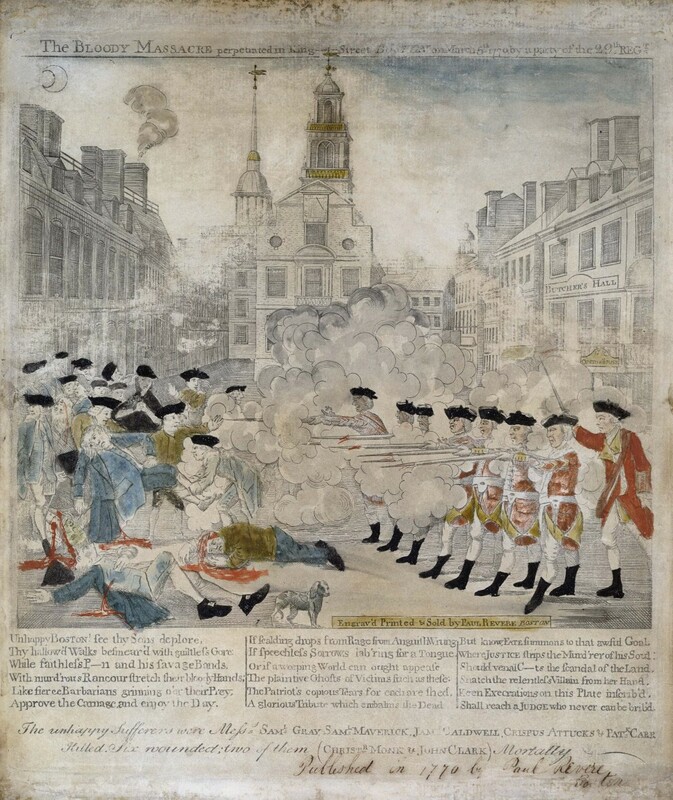 ¶ 40 Leave a comment on paragraph 40 0 This iconic image of the Boston Massacre by Paul Revere sparked fury in both Americans and the British by portraying the redcoats as brutal slaughterers and the onlookers as helpless victims. The events of March 5, 1770 did not actually play out as Revere pictured them, yet his intention was not simply to recount the affair. Revere created an effective propaganda piece that lent credence to those demanding that the British authoritarian rule be stopped. Paul Revere (engraver), “The bloody massacre perpetrated in King Street Boston on March 5th 1770 by a party of the 29th Regt.,” 1770. Library of Congress. ¶ 41 Leave a comment on paragraph 41 1 Resistance again led to repeal. In March of 1770, Parliament repealed all of the new duties except the one on tea, which, like the Declaratory Act, was left, in part, to save face and assert that Parliament still retained the right to tax the colonies. The character of colonial resistance had changed between 1765 and 1770. During the Stamp Act resistance, elites wrote resolves and held congresses while violent, popular mobs burned effigies and tore down houses, with minimal coordination between colonies. But methods of resistance against the Townshend Acts became more inclusive and more coordinated. Colonists previously excluded from meaningful political participation now gathered signatures, and colonists of all ranks participated in the resistance by not buying British goods, and monitoring and enforcing the boycotts. ¶ 42 Leave a comment on paragraph 42 0 Britain’s failed attempts at imperial reform in the 1760s created an increasingly vigilant and resistant colonial population and, most importantly, an enlarged political sphere––both on the colonial and continental levels––far beyond anything anyone could have imagined a few years earlier. A new sense of shared grievances began to join the colonists in a shared American political identity. ¶ 44 Leave a comment on paragraph 44 1 Following the Boston Massacre in 1770, the conflict between the colonies and the mother country cooled. The colonial economy improved as the postwar recession receded. The Sons of Liberty in some colonies sought to continue nonimportation even after the repeal of the Townshend Acts. But, in New York, a door-to-door poll of the population revealed that the majority wanted to end nonimportation. ((New York Gazette, or Weekly Post-Boy, June 18, July 9, 16, 1770.)) Yet, Britain’s desire and need to reform imperial administration remained. ¶ 45 Leave a comment on paragraph 45 2 In April of 1773, Parliament passed two acts to aid the failing East India Company, which had fallen behind in the annual payments it owed Britain. But the Company was not only drowning in debt; it was also drowning in tea, with almost 15 million pounds of it in stored in warehouses from India to England. So, in 1773, the Parliament passed the Regulating Act, which effectively put the troubled company under government control. It then passed the Tea Act, which would allow the Company to sell its tea in the colonies directly and without the usual import duties. This would greatly lower the cost of tea for colonists, but, again, they resisted. ¶ 49 Leave a comment on paragraph 49 1 As word spread throughout the colonies, patriots were emboldened to do the same to the tea sitting in their harbors. Tea was either dumped or seized in Charleston, Philadelphia, and New York, with numerous other smaller “tea parties” taking place throughout 1774. ¶ 50 Leave a comment on paragraph 50 1 Popular protest spread across the continent and down through all levels of colonial society. Fifty-one women in Edenton, North Carolina, for example, signed an agreement––published in numerous newspapers––in which they promised “to do every Thing as far as lies in our Power” to support the boycotts. ((Virginia Gazette, November 3, 1774; Cynthia A. Kierner, “The Edenton Ladies: Women, Tea, and Politics in Revolutionary North Carolina,” in North Carolina Women: Their Lives and Times, ed. Michele Gillsepie and Sally G. McMillen (Athens: University of Georgia Press, 2014), 12-33.)) The ladies of Edenton were not alone in their desire to support the war effort by what means they could. Women across the thirteen colonies could most readily express their political sentiments as consumers and producers. Because women were often making decisions regarding which household items to purchase, their participation in consumer boycotts held particular weight. ((Ellen Hartigan-O’Connor, The Ties that Buy: Women and Commerce in Revolutionary America (Philadelphia: University of Pennsylvania Press, 2009), 178-84.)) Some women also took to the streets as part of more unruly mob actions, participating in grain riots, raids on the offices of royal officials, and demonstrations against the impressment of men into naval service. The agitation of so many helped elicit responses from both Britain and the colonial elites. ¶ 51 Leave a comment on paragraph 51 1 Britain’s response was swift. The following spring, Parliament passed four acts known collectively, by the British, as the “Coercive Acts.” Colonists, however, referred to them as the “Intolerable Acts.” First, the Boston Port Act shut down the harbor and cut off all trade to and from the city. The Massachusetts Government Act put the colonial government entirely under British control, dissolving the assembly and restricting town meetings. The Administration of Justice Act allowed any royal official accused of a crime to be tried in Britain rather than by Massachusetts courts and juries. Finally, the Quartering Act, passed for all colonies, allowed the British army to quarter newly arrived soldiers in colonists’ homes. Boston had been deemed in open rebellion, and the King, his Ministry, and Parliament acted decisively to end the rebellion. ¶ 52 Leave a comment on paragraph 52 1 The Ministry, however, did not anticipate the other colonies coming to the aid of Massachusetts. Colonists collected food to send to Boston. Virginia’s House of Burgesses called for a day of prayer and fasting to show their support. Rather than isolating Massachusetts, as the Ministry had hoped, the Coercive Acts fostered the sense of shared identity created over the previous decade. After all, if the Ministry and Parliament could dissolve Massachusetts’ government, nothing could stop them from doing the same to any of her sister colonies. In Massachusetts, patriots created the “Provincial Congress,” and, throughout 1774, they seized control of local and county governments and courts. ((Ray Raphael, The First American Revolution: Before Lexington and Concord (New York: New Press, 2002), 59-168.)) In New York, citizens elected committees to direct the colonies’ response to the Coercive Acts, including a Mechanics’ Committee of middling colonists. By early 1774, Committees of Correspondence and/or extra-legal assemblies were established in all of the colonies except Georgia. And throughout the year, they followed Massachusetts’ example by seizing the powers of the royal governments. ¶ 53 Leave a comment on paragraph 53 1 Committees of Correspondence agreed to send delegates to a Continental Congress to coordinate an inter-colonial response. The First Continental Congress convened on September 5, 1774. Over the next six weeks, elite delegates from every colony but Georgia issued a number of documents, including a “Declaration of Rights and Grievances.” This document repeated the arguments that colonists had been making since 1765: colonists retained all the rights of native Britons, including the right to be taxed only by their own elected representatives as well as the right to trial-by-jury. ¶ 55 Leave a comment on paragraph 55 0 But not all colonists were patriots. Indeed, many remained faithful to the King and Parliament, while a good number took a neutral stance. As the situation intensified throughout 1774 and early 1775, factions emerged within the resistance movements in many colonies. Elite merchants who traded primarily with Britain, Anglican clergy, and colonists holding royal offices depended on and received privileges directly from their relationship with Britain. Initially, they sought to exert a moderating influence on the resistance committees but, following the Association, a number of these colonists began to worry that the resistance was too radical and aimed at independence. They, like most colonists in this period, still expected a peaceful conciliation with Britain, and grew increasingly suspicious of the resistance movement. ¶ 56 Leave a comment on paragraph 56 1 However, by the time the Continental Congress met again in May 1775, war had already broken out in Massachusetts. On April 19, 1775, British regiments set out to seize local militias’ arms and powder stores in Lexington and Concord. The town militia met them at the Lexington Green. The British ordered the militia to disperse when someone fired, setting off a volley from the British. The battle continued all the way to the next town, Concord. News of the events at Lexington spread rapidly throughout the countryside. 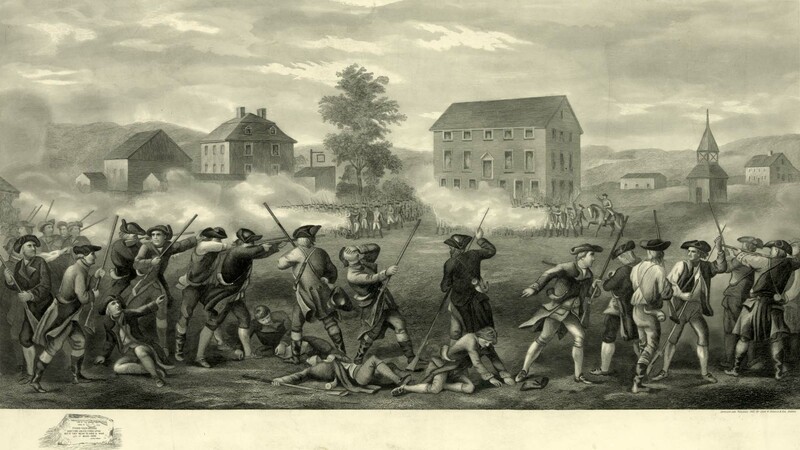 Militia members, known as “minutemen,” responded quickly and inflicted significant casualties on the British regiments as they chased them back to Boston. 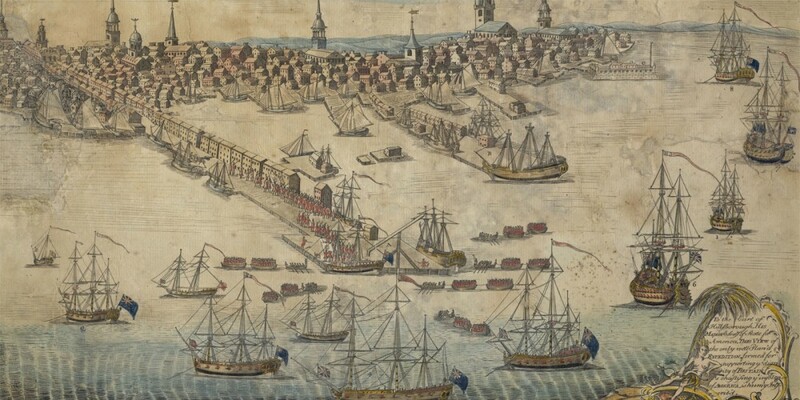 Approximately 20,000 colonial militiamen lay siege to Boston, effectively trapping the British. In June, the militia set up fortifications on Breed’s Hill overlooking the city. In the misnamed “Battle of Bunker Hill,” the British attempted to dislodge them from the position with a frontal assault, and, despite eventually taking the hill, they suffered severe casualties at the hands of the colonists. ¶ 57 Leave a comment on paragraph 57 0 “The Battle of Lexington,” Published by John H. Daniels & Son, c1903. Library of Congress. ¶ 59 Leave a comment on paragraph 59 0 While men in Boston fought and died, the Continental Congress struggled to organize a response. The radical Massachusetts delegates––including John Adams, Samuel Adams, and John Hancock––implored the Congress to support the Massachusetts militia then laying siege to Boston with little to no supplies. Meanwhile, many delegates from the Middle Colonies––including New York, New Jersey, and Philadelphia––took a more moderate position, calling for renewed attempts at reconciliation. In the South, the Virginia delegation contained radicals such as Richard Henry Lee and Thomas Jefferson, while South Carolina’s delegation included moderates like John and Edward Rutledge. The moderates worried that supporting the Massachusetts militia would be akin to declaring war. 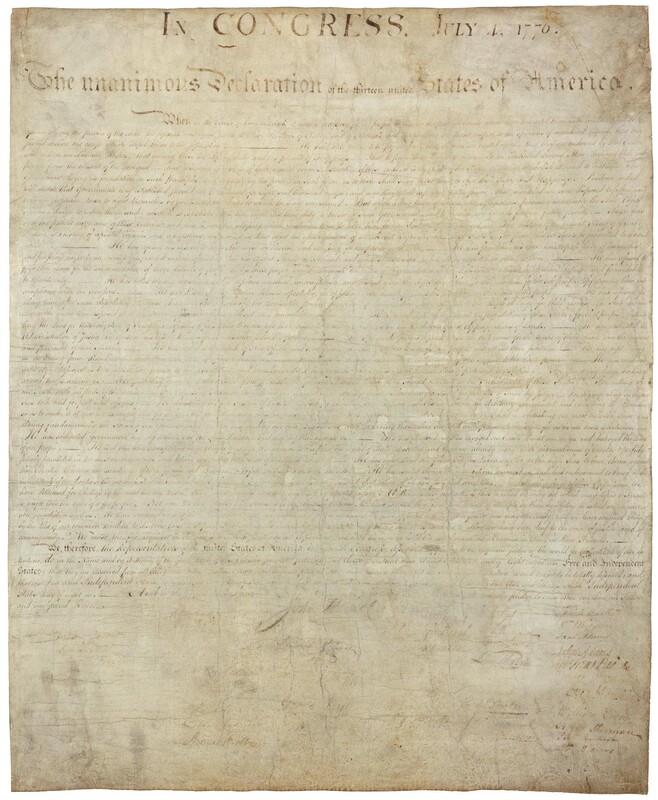 ¶ 60 Leave a comment on paragraph 60 0 The Congress struck a compromise, agreeing to adopt the Massachusetts militia and form a Continental Army, naming Virginia delegate, George Washington, commander-in-chief. They also issued a “Declaration of the Causes of Necessity of Taking Up Arms” to justify this decision. At the same time, the moderates drafted an “Olive Branch Petition” which assured the King that the colonists “most ardently desire[d] the former Harmony between [the mother country] and these Colonies.” Many understood that the opportunities for reconciliation were running out. After Congress had approved the document, Benjamin Franklin wrote to a friend saying, “The Congress will send one more Petition to the King which I suppose will be treated as the former was, and therefore will probably be the last.” Congress was in the strange position of attempting reconciliation while publicly raising an army. ¶ 61 Leave a comment on paragraph 61 1 The petition arrived in England on August 13, 1775, but, before it was delivered, the King issued his own “Proclamation for Suppressing Rebellion and Sedition.” He believed his subjects in North America were being “misled by dangerous and ill-designing men,” who, were “traitorously preparing, ordering, and levying war against us.” In an October speech to Parliament, he dismissed the colonists’ petition. The King had no doubt that the resistance was “manifestly carried on for the purpose of establishing an independent empire.” By the start of 1776, talk of independence was growing while the prospect of reconciliation dimmed. ¶ 62 Leave a comment on paragraph 62 1 In the opening months of 1776, independence, for the first time, became part of the popular debate. Town meetings throughout the colonies approved resolutions in support of independence. Yet, with moderates still hanging on, it would take another seven months before the Continental Congress officially passed the independence resolution. A small forty-six-page pamphlet published in Philadelphia and written by a recent immigrant from England captured the American conversation. Thomas Paine’s Common Sense argued for independence by denouncing monarchy and challenging the logic behind the British Empire, saying, “There is something absurd, in supposing a continent to be perpetually governed by an island.” His combination of easy language, biblical references, and fiery rhetoric proved potent and the pamphlet was quickly published throughout the colonies. Arguments over political philosophy and rumors of battlefield developments filled taverns throughout the colonies. ¶ 64 Leave a comment on paragraph 64 0 Dunmore’s Proclamation had the additional effect of pushing many white Southerners into rebellion. After the Somerset case in 1772 abolished slavery on the British mainland, some American slave-owners began to worry about the growing abolitionist movement in the mother country. Somerset and now Dunmore began to convince some slave owners that a new independent nation might offer a surer protection for slavery. Indeed, the Proclamation laid the groundwork for the very unrest that loyal southerners had hoped to avoid. Consequently, slaveholders often used violence to prevent their slaves from joining the British or rising against them. Virginia enacted regulations to prevent slave defection, threatening to ship rebellious slaves to the West Indies or execute them. Many masters transported their enslaved people inland, away from the coastal temptation to join the British armies, sometimes separating families in the process. ¶ 67 Leave a comment on paragraph 67 1 Delegates went scurrying back to their assemblies for new instructions and nearly a month later, on July 2, the resolution finally came to a vote. It was passed 12-0 with New York, under imminent threat of British invasion, abstaining. ¶ 70 Leave a comment on paragraph 70 1 The majority of the document outlined a list of specific grievances that the colonists had with the many actions taken by the British during the 1760s and 1770s to reform imperial administration. An early draft blamed the British for the transatlantic slave trade and even for discouraging attempts by the colonists to promote abolition. Delegates from South Carolina and Georgia as well as those from northern states who profited from the trade all opposed this language and it was removed. ¶ 76 Leave a comment on paragraph 76 2 An even greater success followed in upstate New York. In 1777, in an effort to secure the Hudson River, British General John Burgoyne led an army from Canada through upstate New York. There, he was to meet up with a detachment of General Howe’s forces marching north from Manhattan. However, Howe abandoned the plan without telling Burgoyne and instead sailed to Philadelphia to capture the new nation’s capital. The Continental Army defeated Burgoyne’s men at Saratoga, New York. ((Richard M. Ketchum, Saratoga: Turning Point of America’s Revolutionary War (New York: H. Holt, 1997).)) This victory proved a major turning point in the war. Benjamin Franklin had been in Paris trying to secure a treaty of alliance with the French. However, the French were reluctant to back what seemed like an unlikely cause. News of the victory at Saratoga convinced the French that the cause might not have been as unlikely as they had thought. A “Treaty of Amity and Commerce” was signed on February 6, 1778. The treaty effectively turned a colonial rebellion into a global war as fighting between the British and French soon broke out in Europe and India. ¶ 77 Leave a comment on paragraph 77 0 In this 1782 cartoon, the British lion faces a spaniel (Spain), a rooster (France), a rattlesnake (America), and a pug dog (Netherlands). Though the caption predicts Britain’s success, it illustrates that Britain faced challenges –and therefore drains on their military and treasury—from more than just the American rebels. J. Barrow, “The British Lion engaging Four Powers,” 1782, via National Maritime Museum, Greenwich, London. ¶ 78 Leave a comment on paragraph 78 0 Howe had taken Philadelphia in 1777 but returned to New York once winter ended. He slowly realized that European military tactics would not work in North America. In Europe, armies fought head-on battles in attempt to seize major cities. However, in 1777, the British had held Philadelphia and New York and yet still weakened their position. Meanwhile, Washington realized after New York that the largely untrained Continental Army could not match up in head-on battles with the professional British army. So he developed his own logic of warfare, which involved smaller, more frequent skirmishes and avoided any major engagements that would risk his entire army. As long as he kept the army intact, the war would continue, no matter how many cities the British captured. ¶ 81 Leave a comment on paragraph 81 0 Lord Cornwallis’s surrender signalled the victory of the American revolutionaries over what they considered to be the despotic rule of Britain. 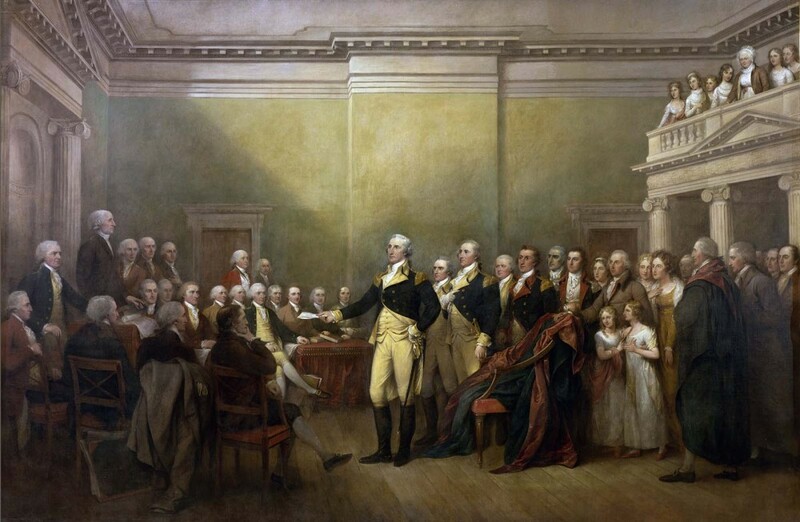 This moment would live on in American memory as a pivotal one in the nation’s origin story, prompting the United States government to commission artist John Trumbull to create this painting of the event in 1817. John Trumbull, Surrender of Lord Cornwallis, 1820. Via Wikimedia. ¶ 84 Leave a comment on paragraph 84 0 American soldiers came from a variety of backgrounds and had numerous reasons for fighting with the American army. Jean-Baptiste-Antoine DeVerger, a French sublieutenant at the Battle of Yorktown, painted this watercolor soon after that battle and chose to depict four men in men military dress: an African American soldier from the 2nd Rhode Island Regiment, a man in the homespun of the militia, another wearing the common “hunting shirt” of the frontier, and the French soldier on the end. Jean-Baptiste-Antoine DeVerger, “American soldiers at the siege of Yorktown,” 1781, via Wikimedia. ¶ 85 Leave a comment on paragraph 85 0 Slaves and free blacks also impacted (and were impacted by) the Revolution. The British were the first to recruit black (or “Ethiopian”) regiments, as early as Dunmore’s Proclamation of 1775 in Virginia, which promised freedom to any slaves who would escape their masters and join the British cause. At first, Washington, a slaveholder himself, resisted allowing free blacks and former slaves to join the Continental Army, but he eventually relented. In 1775, Peter Salem’s master freed him to fight with the militia. Salem faced British Regulars in the battles at Lexington and Bunker Hill, where he fought valiantly with around three-dozen other black Americans. Salem not only contributed to the cause, but he earned the ability to determine his own life after his enlistment ended. Salem was not alone, but many more slaves seized upon the tumult of war to run away and secure their own freedom directly. Historians estimate that between 30,000 and 100,000 slaves deserted their masters during the war. ¶ 86 Leave a comment on paragraph 86 1 Men and women together struggled through years of war and hardship. For patriots (and those who remained neutral), victory brought new political, social, and economic opportunities but it also brought new uncertainties. The war decimated entire communities, particularly in the South. Thousands of women throughout the nation had been widowed. The American economy, weighed down by war debt and depreciated currencies, would have to be rebuilt following the war. State constitutions had created governments, but now men would have to figure out how to govern. The opportunities created by the Revolution had come at great cost, in both lives and fortune, and it was left to the survivors to seize those opportunities and help forge and define this new nation-state that they had helped create. ¶ 89 Leave a comment on paragraph 89 1 Like the earlier distinction between “origins” and “causes,” the Revolution also had short- and long-term consequences. Perhaps the most important immediate consequence of declaring independence was the creation of state constitutions in 1776 and 1777. The Revolution also unleashed powerful political, social, and economic forces that would transform the new nation’s politics and society, including increased participation in politics and governance, the legal institutionalization of religious toleration, and the growth and diffusion of the population, particularly westward expansion. The Revolution also had significant short-term effects on the lives of women in the new United States of America. In the long-term, the Revolution would also have significant effects on the lives of slaves and free blacks as well as the institution of slavery itself. It also affected Native Americans by opening up western settlement and creating governments hostile to their territorial claims. Even more broadly, the Revolution ended the mercantilist economy, opening new opportunities in trade and manufacturing. ¶ 90 Leave a comment on paragraph 90 1 The new states drafted written constitutions, which, at the time, was an important innovation from the traditionally unwritten British Constitution. These new state constitutions were based on the idea of “popular sovereignty,” i.e., that the power and authority of the government derived from the people. ((Willi Paul Adams, The First American Constitutions: Republican Ideology and the Making of the State Constitutions in the Revolutionary Era (Chapel Hill: Published for the Institute of Early American History by the University of North Carolina Press, 1980; repr. Lanham: Rowman and Littlefield, 2001), 126-46.)) Most created weak governors and strong legislatures with more regular elections and moderately increased the size of the electorate. A number of states followed the example of Virginia and included a declaration or “bill” of rights in their constitution designed to protect the rights of individuals and circumscribe the prerogative of the government. Pennsylvania’s first state constitution was the most radical and democratic. They created a unicameral legislature and an Executive Council but no genuine executive. All free men could vote, including those who did not own property. Massachusetts’ constitution, passed in 1780, was less democratic in structure but underwent a more popular process of ratification. In the fall of 1779, each town sent delegates––312 in all––to a constitutional convention in Cambridge. Town meetings debated the constitution draft and offered suggestions. Anticipating the later federal constitution, Massachusetts established a three-branch government based on checks and balances between the branches. 1776 was the year of independence, but it was also the beginning of an unprecedented period of constitution-making and state-building. ¶ 91 Leave a comment on paragraph 91 1 The Continental Congress ratified the Articles of Confederation in 1781. The Articles allowed each state one vote in the Continental Congress. But the Articles are perhaps most notable for what they did not allow. Congress was given no power to levy or collect taxes, regulate foreign or interstate commerce, or establish a federal judiciary. These shortcomings rendered the post-war Congress rather impotent. ¶ 92 Leave a comment on paragraph 92 1 Political and social life changed drastically after independence. Political participation grew as more people gained the right to vote, leading to a greater importance being placed on representation within government. ((Gordon S. Wood, The Creation of the American Republic, 1776-1787 (Chapel Hill: Published for the Institute of Early American History and Culture by the University of North Carolina Press, 1969). )) In addition, more common citizens (or “new men”) played increasingly important roles in local and state governance. Hierarchy within the states underwent significant changes. Society became less deferential and more egalitarian, less aristocratic and more meritocratic. ¶ 93 Leave a comment on paragraph 93 1 The Revolution’s most important long-term economic consequence was the end of mercantilism. The British Empire had imposed various restrictions on the colonial economies including limiting trade, settlement, and manufacturing. The Revolution opened new markets and new trade relationships. The Americans’ victory also opened the western territories for invasion and settlement, which created new domestic markets. Americans began to create their own manufactures, no longer content to rely on those in Britain. ¶ 94 Leave a comment on paragraph 94 2 Despite these important changes, the American Revolution had its limits. Following their unprecedented expansion into political affairs during the imperial resistance, women also served the patriot cause during the war. However, the Revolution did not result in civic equality for women. Instead, during the immediate post-war period, women became incorporated into the polity to some degree as “republican mothers.” These new republican societies required virtuous citizens and it became mothers’ responsibility to raise and educate future citizens. This opened opportunity for women regarding education, but they still remained largely on the peripheries of the new American polity. ¶ 95 Leave a comment on paragraph 95 0 While in the 13 colonies boycotting women were seen as patriots, they were mocked in British prints like this one as immoral harlots sticking their noses in the business of men. Philip Dawe, “A Society of Patriotic Ladies at Edenton in North Carolina, March 1775. Metropolitan Museum of Art. ¶ 98 Leave a comment on paragraph 98 0 Joseph Brandt as painted by George Romney. 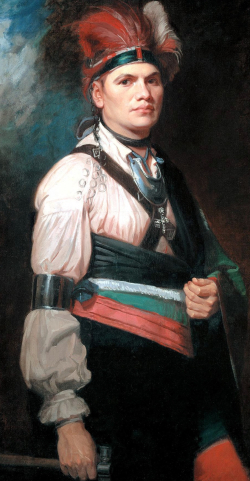 Brandt was a Mohawk leader who led Mohawk and British forces in western New York. Via Wikimedia. ¶ 100 Leave a comment on paragraph 100 0 Native Americans, too, participated in and were affected by the Revolution. Many Native American tribes and confederacies, such as the Shawnee, Creek, Cherokee, and Iroquois, had sided with the British. They had hoped for a British victory that would continue to restrain the land-hungry colonial settlers from moving west beyond the Appalachian Mountains. Unfortunately, the Americans’ victory and Native Americans’ support for the British created a pretense for justifying the rapid, and often brutal expansion into the western territories. Native American tribes would continue to be displaced and pushed further west throughout the nineteenth century. Ultimately, American independence marked the beginning of the end of what had remained of Native American independence. ¶ 102 Leave a comment on paragraph 102 0 The American Revolution freed colonists from British rule and offered the first blow in what historians have called “the age of democratic revolutions.” The American Revolution was a global event. ((For a summary of the global aspects of the Revolution, see Ted Brackemyre, “The American Revolution: A Very European Ordeal,” U.S. History Scene, http://ushistoryscene.com/article/am-rev-european-ordeal.)) Revolutions followed in France, then Haiti, and then South America. 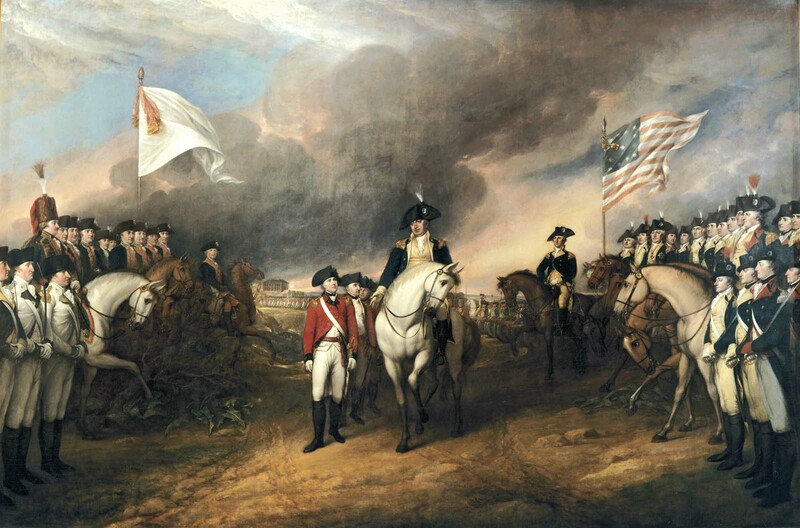 The American Revolution meanwhile wrought significant changes to the British Empire. Many British historians even use the Revolution as a dividing point between a “first British Empire” and a “second British Empire.” At home, however, the Revolution created a new nation-state, the United States of America. By September of 1783, independence had been won. What that independence would look like, however, was still very much up for grabs. In the 1780s, Americans would shape and then re-shape that nation-state, first with the Articles of Confederation, ratified in 1781, and then with the Constitution in 1787 and 1788. ¶ 104 Leave a comment on paragraph 104 3 The Revolution was not won by a few “founding fathers.” Men and women of all ranks contributed to the colonies’ most improbable victory, from the commoners protesting against the Stamp Act to the women who helped organize the boycotts to the Townhend duties; from the men, black and white, who fought in the army and the women who contributed to its support. The Revolution, however, did not aim to end all social and civic inequalities in the new nation, and, in the case of Native Americans, created a new degree of inequality. But, over time, the Revolution’s rhetoric of equality, as encapsulated in the Declaration of Independence, helped highlight some of those inequalities and became a shared aspiration for future social and political movements, including, among others, the abolitionist and women’s rights movements of the nineteenth century, the suffragist and civil rights movements of the twentieth century, and the gay rights movement of the twenty-first century. ¶ 106 Leave a comment on paragraph 106 0 This chapter was edited by Michael Hattem, with content contributions by James Ambuske, Alexander Burns, Joshua Beatty, Christina Carrick, Christopher Consolino, Michael Hattem, Timothy C. Hemmis, Joseph Moore, Emily Romeo, and Christopher Sparshott. ¶ 107 Leave a comment on paragraph 107 0 Recommended citation: James Ambuske et al., “The American Revolution,” Michael Hattem, ed., in The American Yawp, Joseph Locke and Ben Wright, eds., last modified August 1, 2016, http://www.AmericanYawp.com. Glorious Revolution area (1688): 2 causes to failure of defining colonies’ relation to empire and institute. Colonists thrived because of Britain’s hands-off approach to colonies. Samuel Adams (Boston Gazette), described each colony as a “separate body politic” from Britain. Board of Traded tried to limit the assemblies power but their power only grew. Political culture leaned toward republicanism: Putting the public before self. small portion held these ideas but it was accepted. 1740’s Enlightenment and the Great Awakening combined and challenged older thoughts on authority. Philosopher with greatest impact John Locke. Locke made the idea of education spread. 1739-40 George Whitefield spoke about conversion (taking responsibility for one’s own unmediated relationship with God). Whitefield, like Locke, made people question authority. Post-war empire cost a lot of money not including the expenses that led to the increase in their national debt. King George 3 (1760) brought Tories. Ordered forbade settlement west of Appalachian Mts. in order to limit wars with Native Americans. Sugar Act: Done to stop the widespread smuggling of molasses in New England. Currency Act: restricted paper money. These acts increased taxation and restricted liberties. 1765 Parliament passed the Stamp Act. 1764 Sugar Act was created to be a direct tax. First direct tax. economic: Boycotts of GB’s goods spread to NYC, and Philadelphia, until January 1766, London merchants sent a letter to parliament saying they were losing money because of the act. POPULAR PROTEST: Violent riots broke out in Boston. Andrew Oliver burned down a building he owned. Nov 16, the original 12 distributors resigned.Sons of Liberty took control over colonists. February 1766 Stamp Act repealed. Declaratory Act put in allowing parliament to have full control. Townshend Acts passed in June 1767 to gain revenue which created new customs duties on common items; lead, glass, paint and tea. Ability to have American Board of Customs Commissioners. Elite, middling, and working class participated together on more boycotting. Women became involved in gathering signatures, creating commentaries in the newspaper and making clothing for the community. Non-consumption agreements divided the cultural relationship colonists had with their mother country. Boston Massacre: March 5, 1770- a crowd gathered around the Custom House and threw things at it and a small # of soldiers came. The crowd was unhappy with that and became enraged. The soldiers killed 5 people. One of the ring leaders died Crispus Attucks. March 1770 Parliament repealed the new duties except the one on tea. During the Stamp Act the colonists weren’t resisting cohesively or as coordinated as they were during the Townshend Act. Colonists and mother country back on good terms in 1770. 1773 Parliament passed the Regulating Act, which gave the failing East India Company the ability to sell tea without the import duties (Mainly because EIC opened Britian money). The people resisted because they didn’t like the idea of Parliament taxing them. Tea Act said that it was a duty to pay when the ship unloaded. November of 1773 Boston Sons of Liberty led by Samuel Adams and John Hancock said they would prevent the tea from lading. Men dressed as Mohawk Indians and either seized or dumped tea in Charleston, Philadelphia and New York. In Philadelphia, threats against the captain of the Tea ship (the Polly) kept the tea from even being landed. 51 Edenton, NC women signed an agreement to support boycotts. Coercive Acts (Intolerable Acts): 1st- Boston Port Act shut down harbor and cut off trade. 2nd- Massachusetts Government Act colonia gov. under British control, which took away assemblies and town meetings. 3rd Administration of Justice Act allowed any royal official accused of a crime to be tried in a Britain court, rather than Massachusetts. 4th- Quartering Act allowed British army in colonists’ homes. Ministry didn’t expect other colonies coming to aid of Massachusetts. Colonists sent food, Virginia’s House of Burgesses called for prayer and fasting to show support. Massachusetts patriots created Provincial Congress (1774) they seized control of local and county gov. courts. Early 1774 Committees of Correspondence and other assemblies were made except in Georgia. Committees of Correspondence: sent delegates to Continental Congress. 1st Continental Congress Sept. 5, 1774 where they issued documents including Declaration of Rights and Grievances. Congress issued a document known as the “continental Association”. The association said the people were unhappy with the current government. It also said that every committee has to be chosen in every county, city and town. Delegates also agreed to a continental non-importation, non consumption and non exploration agreement to stop slave trade. Colonists divided. Some were patriots and some were faithful to the King. April 19th, 1775 Brits were going to seize local militias’ arms and powder stores in Lexington and Concord. Both met at Lexington Green. An unexpected shot led to constant fighting up to Concord. Congress made a promise and agreed to adopt Massachusetts militia and form a Continental Army, George Washington was commander-in-chief. But Congress was still trying to reconcile with the mother country. Before the petition was delivered to England on August 13, 1775 the King missed a Proclamation for Suppressing Rebellion and Sedition (he said no to the petition because he thought it would lead to an independent empire). Thomas Paine’s Common sense denounced the monarch and challenged the logic behind the British Empire. Sparked more people for independence. Lord Dunmore created a proclamation for slaves. After the Somerset case in 1772 slavery was abolished on the British mainland. However, colonists threatened slaves into staying. New York didn’t vote because they were under threat of British invasion. The document outlined a list of grievances that colonists had with many actions the British took during the 1760s and 70s. An early draft blamed Brits for transatlantic slave trade and discouraging attempts by colonists to promote abolition. SC and GA were removes for opposing. British attacked in Oct. 1776 on Brooklyn and Manhattan and won. Washington launched a surprise attack on the Hessian camp at Trenton on Christmas Day. I twas a success. 1777 Brit. General John Burgoyne wanted the Hudson River, but the absence of General Howe and his forces (who received the nations capital, Philadelphia), led to General Burgoyne’s loss. 1778 “treat of Amity and Commerce” signed. This treaty turned colonial rebellion into global war once Brit and French fighting broke out in Europe and India. 1778 the British shifted their attentions to the south where they campaigned for more support from Virginia, SC and GA. British didn’t have the control needed. 1781 while the British was fighting everyone, the Colonists decided to gain assistance from the French who circled Gen. Cornwallis who was waiting for supplies from NY. British had nothing left, so they surrendered. Peace negotiations took place in France and the war came to an end on September 3, 1783. Costs of war: soldiers died at Vallery Forge in 1777-8 from disease. Women had to take care of the family and take on men’s duties. (Abigail Adams and Mary Silliman important women). Slaves were able to determine lives after enlistment. 30,000 – 100,000 slaves deserted their masters during the war. For Patriots (and those who remained neutral) victory brought new political, social and economic opportunities and new uncertainties. War killed various communities (in the South). Women thought the nation would be widowed. War debt and depreciated currencies. Pennsylvania’s first state constitution was most radical and democratic. Had unicameral legislature, all free men could vote,. Massachusetts’ constitution passed in 1780. Less democratic. Established a 3 branch government based on checks and balances. Continental Congress ratified Articles of Confederation in 1781. Shortcoming: Congress had no power to levy or collect taxes, regulate foreign or interstate commerce, or establish a federal judiciary. Society was less deferential and more egalitarian, less aristocratic and more meritocratic. Revolution opened new markets and new trade relationships. Western territories for invasion and settlement which created new domestic markets. Treaty of Paris promised loyalist their land lost from war but Americans reneged throughout the 1780s. Loyalist on losing side of revolution and many lost everything. 1783 thousands of Loyalist former slaves fled with British army. Black loyalists, continued to face social and economic marginalization, including restrictions on land ownership within British Empire. Northern states passed gradual emancipation laws. Slave revolts began for freedom. Revolution failed to reconcile slavery with new egalitarian republican societies. This filed over in the 1830s and 1840s and effectively tore the nation in two in the 1850s. Am I incorrect in saying that it was not only Gay rights, but LGBTQ rights in general? I’m not sure. Typo on the second line; says “Townhend duties”, should be “Townshend”.